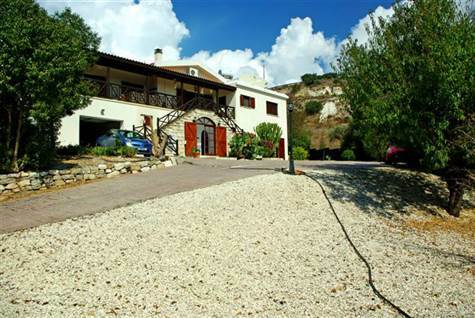 Cyprus Property Blog by Cleo : Nata Villa for sale - Just listed - Huge Plot and Spacious Home with lots of extras! Nata, Paphos - This very unusual villa is a private retreat for the current owners, who have truly made it something special. Built in 1998 with an original living space of 188m2, it now boasts 377m2 of covered area over two floors. It is close to the airport but not on the flight path. The area is peaceful and the property has beautiful countryside views with a view of the sea horizon in the distance. The popular Periklis Taverna, known for its beautiful views and a superb Sunday smorgasbord lunch and lively evenings is a short stroll away. The property consists of 5 double bedrooms and 4 bathrooms, the master bedroom has a working fireplace, walk in dressing room, a private side balcony and an ensuite marble bathroom, whilst two of the other bedrooms also enjoy ensuite facilities. Upstairs is more traditional in style with a huge kitchen family room with an open fireplace and a walk in larder, a lounge with an open fireplace and 3 of the 5 bedrooms (including the master). Downstairs is totally ultra modern with a black and white theme running throughout and is newly allocated, comprising a huge living space with a secluded area which could be another kitchen, everything is there ready, electricity water etc. There are two massive bedrooms with beautiful fitted wardrobes and 2 bathrooms. Outside the gardens comprise an orchard at the front beyond the parking areas and the 8m x 10m eco heated pool and patios to the rear accessed from the kitchen and dining/family room. At the side a door from the dining rooms leads to the large outside kitchen, ideal for bbq's and al fresco entertaining. The front covered terrace is accessed from the upstairs lounge and the master bedroom and enjoys a built in bar. Downstairs is accessed either from the spiral staircase off the dining area and from outside. This could be a totally separate unit if required. This property would be ideal for the owner of a helicopter also as there is plenty of land and convenient to the airport.